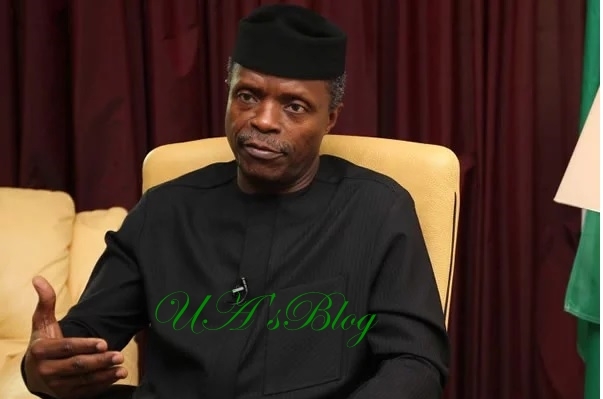 The camp of the Vice President, Prof. Yemi Osinbajo, has said that the meeting recently held in Dubai by the Peoples Democratic Party, PDP, and its presidential candidate, Alhaji Atiku Abubakar was targetted at the reputation of the Vice President. Osinbajo’s camp claimed that the PDP and Atiku were targeting the Vice President by spreading negative and false news ahead of next year’s Presidential elections. A top Presidency source told DAILY POST that the plan in Dubai, United Arab Emirates was designed to ensure that the VP’s populist imagery is damaged in the media by making all attempts to discredit him. The source said, “The diabolical plan by PDP is already in place. We can see it in motion that is how this party operates. In the last two weeks, they have concentrated their effort on the VP in a bid to assail his credibility. “For example, the recent but misrepresented House of Representatives report which was read on the floor of the House was written in Dubai and overseen by the Speaker of the House, Yakubu Dogara. “It is also part of the Dubai resolution to try and weaken the drive of the VP regarding the Buhari Social Investment Programme. “This explains the coordinated attacks on the TraderMoni scheme, as the party and their cronies have started bashing it as an advanced voter buying agenda. The source added that the fear expressed at the Dubai meeting was that if the scheme was not diminished, it’s acceptance with the people will become an herculean task for the PDP and its Presidential candidate to overcome. The source explained further that the PDP has identified VP Osinbajo as the success poster boy of the APC and see him as one who must be tainted. “We must put him on the back foot. It is important to destroy his character ahead of the elections because of the favourable perception that many Nigerians have of him, his capacity and the programs and to reduce the South West support for him as a part of this administration”. The sources continued that the meeting noted that the VP’s Christian character must be impugned and maligned seriously. Speaking further, Akinloye outlined some of the strategies of the PDP which was received from a leader in the opposition party. “At the Dubai meeting, the PDP agreed to do a vigorous opposition research to discredit him (Osinbajo), his family, his faith and programs. “They also agreed to commission moles and other agents to dig up dirt on subject.